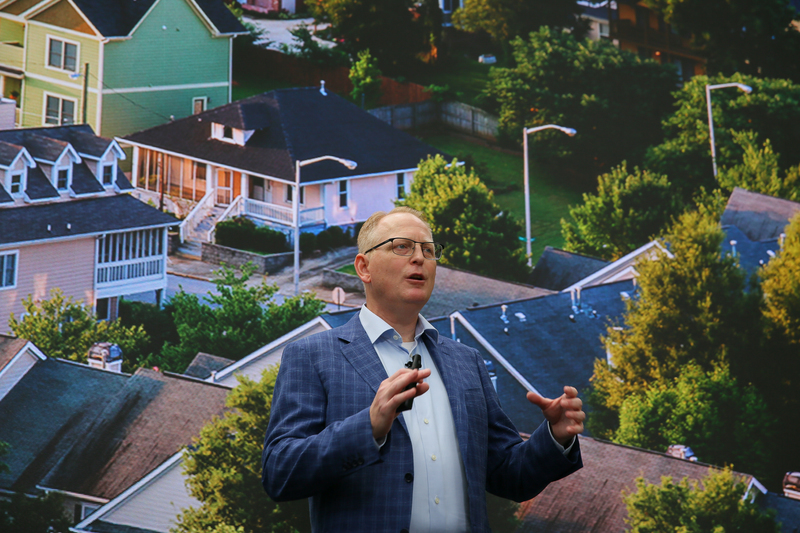 "We also realized that the home has to be even smarter on the outside." Mentions purchase of Ring and Blink. "Nobody is going to complain about a safer home in 10 years." Moving on to home security. Ring update? I hope. 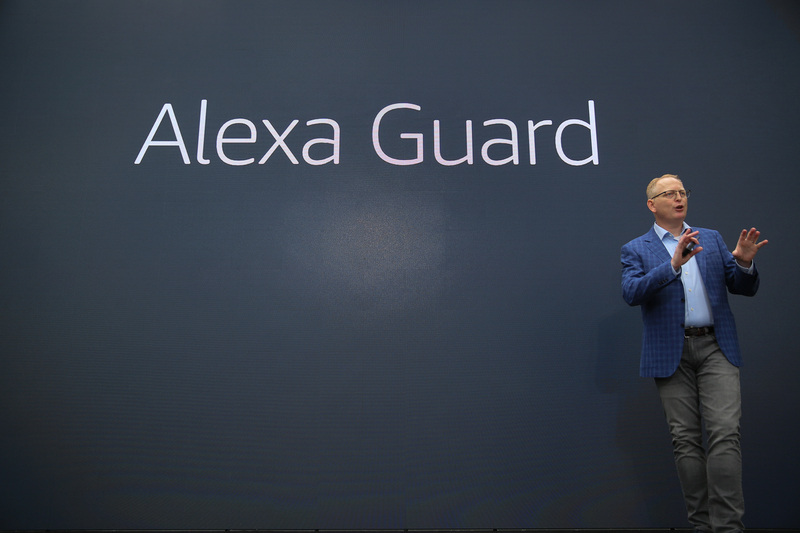 Alexa Guard, another new thing. Alexa can move your devices into "guard mode." Introducing "Echo Guard." Say something like "Alexa, I'm leaving," and she'll move your Echoes into Guard mode. You'll get a notification if they hear breaking glass or the sound of an alarm. If you have smart lights, Guard-mode Alexa will randomly turn them on and off to make it look like you're home. 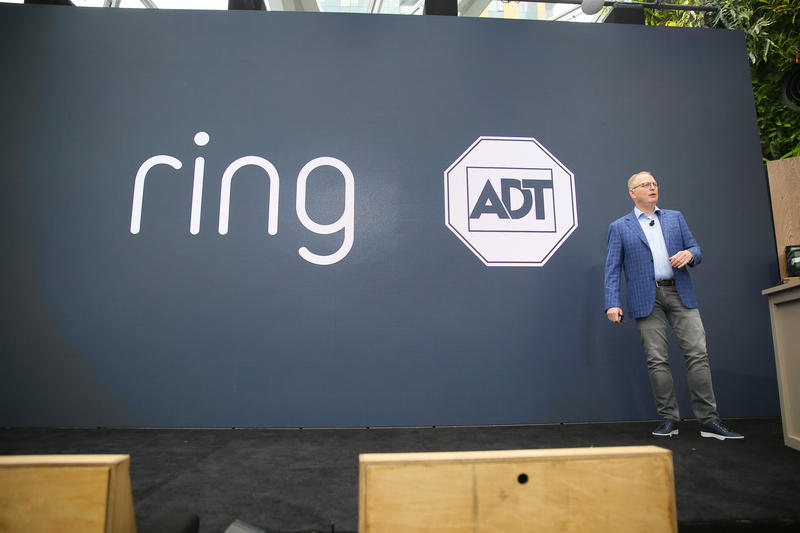 Starting Alexa Guard with Ring and ADT. Can also sync up with Ring or ADT to send those sound alerts straight to the dispatch centers. "We have been blown away by Ring's work to reduce crime in neighborhoods." "They've been protecting more homes than anyone else." Limp gives a shoutout to Ring founder Jamie Siminoff, who's apparently here in the back. Why not bring him up? Can now lock your door from the Ring app. 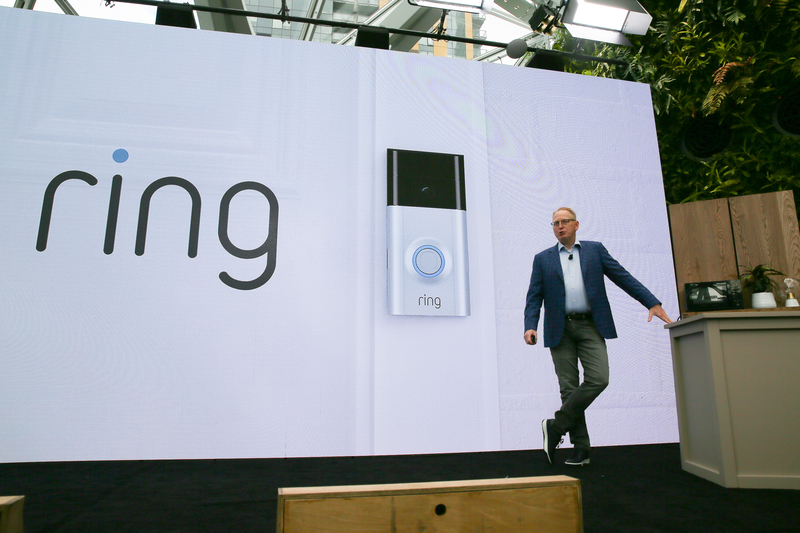 "Today, we're extending Ring Alarm and adding access control." You'll be able to lock compatible smart locks from Schlage, Yale, Kwikset and Danalock right from the RIng app, or disarm your system by punching a code in on the lock. New Ring camera, both wired and battery powered versions. Ring Stick Up Cam, $180. Available later this year. Watching a promo video for Ring's Neighbors app now, a neighborhood-watch for your phone launched earlier this year. Now a video about Ring...phew, we get a short break. 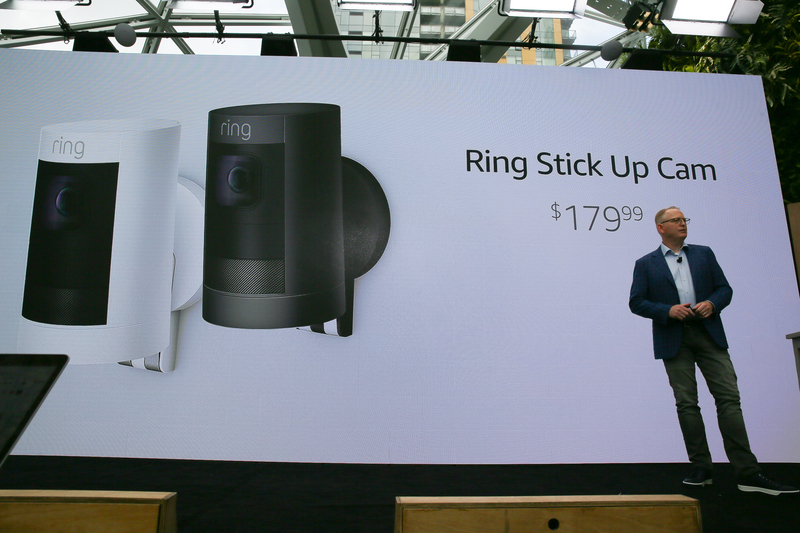 Amazon bought Ring earlier this year for a reported $1 billion. Integrating with a new API, Alexa doorbell API -- if doorbell rings, will show on your Echo Show. Alexa has a new Doorbell API that will of course work with Ring to let you see the doorbell camera's feed on your Echo Show or Echo Spot. Includes support for two-way talk. 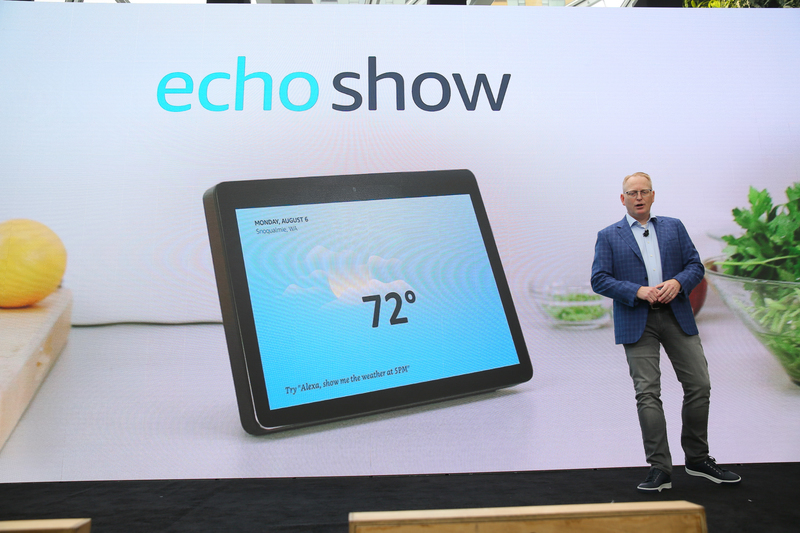 Here it is, an all-new Echo Show. Complete redesign. "This product has been completely redesigned." Integrated a bass radiator inside, real-time Dolby processing. Fabric back-cover matches the new Dot and Echo Plus. Also has the same smart home hub functions as the Echo Plus, with built-in Zigbee support. 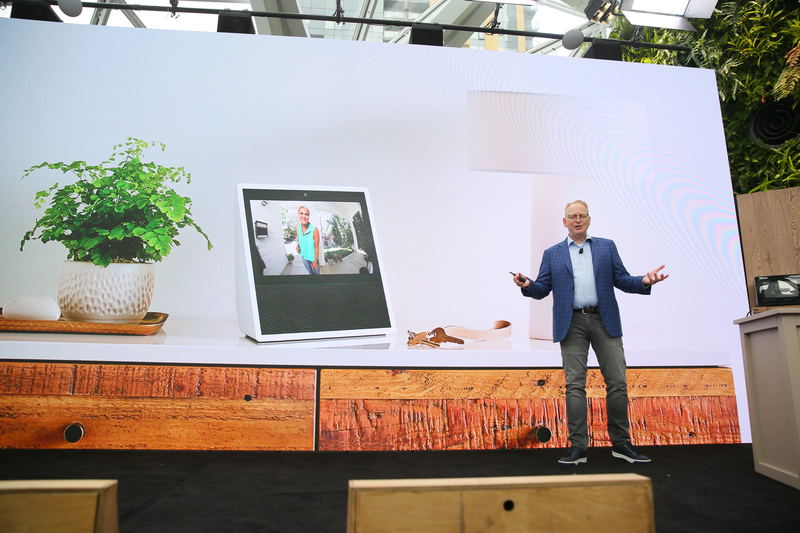 And yep, it looks a lot like some of the new Google Assistant smart displays. Amazon playing some defense, here. Doing demo. 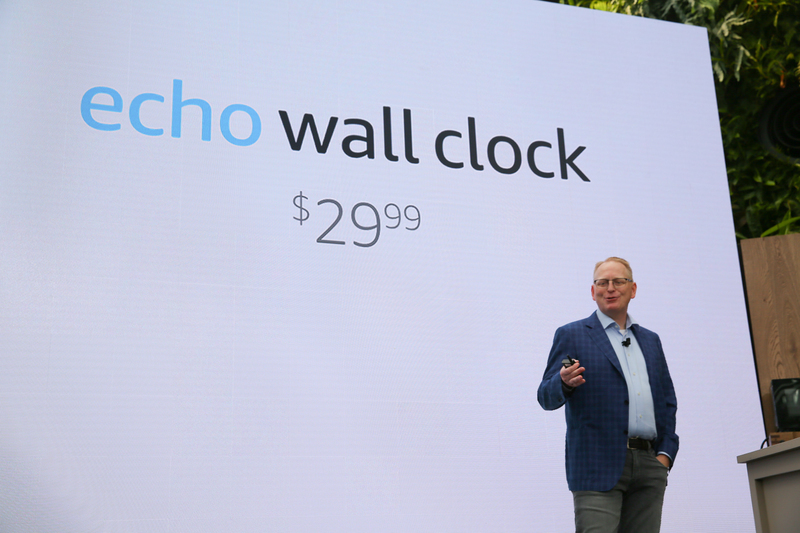 This new Echo Show looks much smaller. Looks like they removed the front speaker section at the bottom. Demo time. Girls Like You by Maroon 5. Sound is filling the sphere. Pretty impressive. 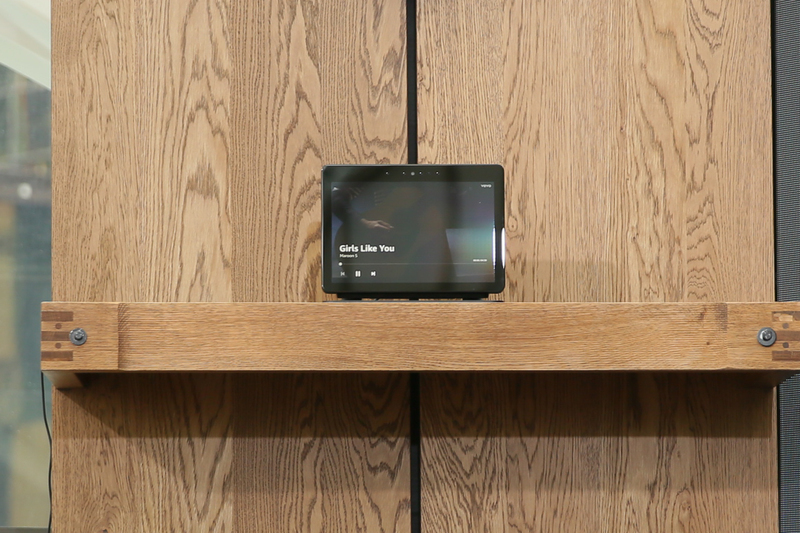 Amazon shoring up what was arguably Alexa's biggest vulnerability.